Cardiac surgery and the postoperative state are associated with increased catecholamine levels . Therefore, beta-blockers are logical agents to prevent atrial fibrillation in this setting. Indeed, many trials have shown a benefit with prophylactic beta-blockade [2-9]. However, the data regarding beta-blockers must be interpreted with caution. Some of the apparent benefit of beta-blockers may be explained by beta-blocker withdrawal in patients assigned to placebo. In addition, many of the beta-blocker trials excluded patients with left ventricular dysfunction and obstructive lung disease, and patients undergoing concomitant valvular surgery. 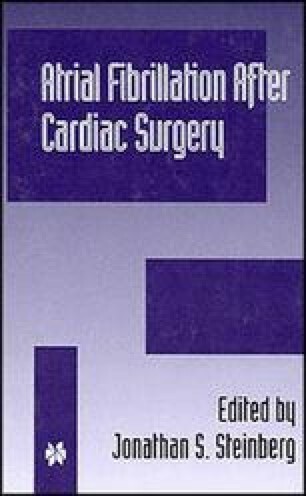 Because of the limitations of beta-blockers and because there is a significant incidence of postoperative atrial fibrillation despite beta-blocker prophylaxis, other pharmacological approaches to prevent postoperative atrial fibrillation have been investigated.